"I was living up there on my own, sat there thinking, 'What's wrong?' I even got to the stage of looking round most days feeling for lumps, thinking the worst." In early 2018, Greg Tansey sat alone in the Highlands, his pelvis aching and his mind racing with all sorts of terrifying possibilities. The midfielder, on loan at Ross County from Aberdeen, had undergone what was supposed to be a routine operation to repair a hernia in September of the previous year. Unbeknown to him and his doctors, the surgery had failed, and Tansey had contracted osteomyelitis, a rare and painful bone infection that can cause permanent damage if not treated. His hernia problems lingered and his agony was misdiagnosed. Over a year on, and now playing for St Mirren, the 30-year-old is still grappling to conquer the infection. In this interview with Sportsound, he recalls the "bitterness" that festered after the medical "error" and his longing to repay St Mirren, while confronting the possibility that he may never play again. Tansey knew something wasn't right when he returned to training with Aberdeen after his first hernia operation. Ross County, in a Scottish Premiership relegation battle, wanted him on loan, but he felt that was beyond him. "Not knowing [what was wrong] was the worst part. Even rolling over when I was doing a quad stretch, I could feel something sort of sliding in my pelvis and moving around," Tansey said. "I said to the physio at the time, 'I don't feel right to go out on loan'. At the end of the day I went, played a few games - or tried to - under a lot of painkillers and it was the worst time of my career by far." Tansey managed only three appearances as the Dingwall side finished bottom of the table and dropped to the second tier. It was a dark time, but in physiotherapist Kevin Bain, Tansey found someone who recognised there was still a serious problem in his pelvis. "He is the reason I've got a chance of continuing to play," he says. "The hernia that I had originally developed at Aberdeen was still there, so that hadn't been fixed, and he said the mesh was six centimetres in the wrong place. All that had to be redone and it took a couple of months. My whole time at Ross County, I felt like I was on a hospital bed or on a physio bed - and I was. "There was a bit of bitterness there as well - I felt, 'How can you get it that wrong?' I couldn't get it out of my head." The infection can - and has - returned. One of Tansey's surgeons likens it to cold sores, a recurring pest that needs to be dealt with whenever it arises. 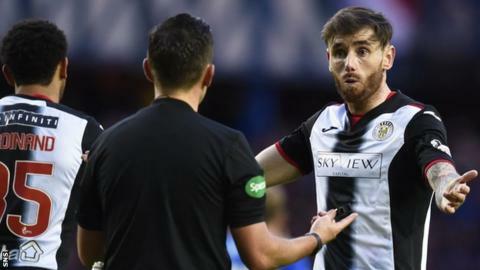 Tansey joined St Mirren on an 18-month deal in January, but has only played eight matches, the most recent of which came almost two months ago. He knows he might never make it back. He has started a business and marketing degree to prepare for life after football, but his burning desire is to repay manager Oran Kearney, the club and its fans for their faith in him. "I've come to terms with the fact there's a possibility I might never play again because of this. And that it all started with a surgery that I was meant to be out for two-and-a-half or three weeks, and it'll be two years by the time I hopefully get back out playing," Tansey says. "I feel like I owe St Mirren a lot because they took me on and they and the gaffer have been top-drawer from day one. I get a lot of messages from St Mirren fans saying, 'Get your head up, keep going', and I thank them for that. It would be very easy for them to think, 'We've signed him and he's turned up injured again' and I wouldn't blame them if they did. But I've had nothing but support."